This week we embark on a two-part segment where we’ll cover fire pump testing, comparing the advantages and disadvantages of two different methods of testing water flow during a fire pump test: external water flow through a hose valve manifold on the exterior of a building, versus a flow meter recirculating loop within the mechanical room. In our first segment, we will examine the common, traditional method of testing fire pumps through use of a hose valve test manifold. 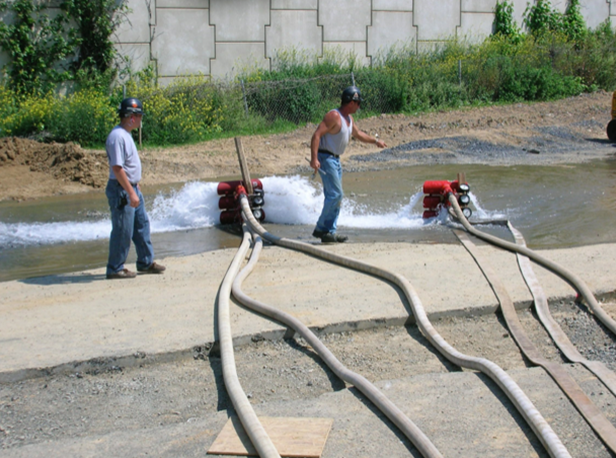 The traditional method of measuring water flow during a fire pump test has involved the use of a hose valve test manifold, intended to be mounted on the exterior of the building, where 50-foot 2-1/2 inch hoses are then attached to allow for water flow where measurements can be made to the water streams. 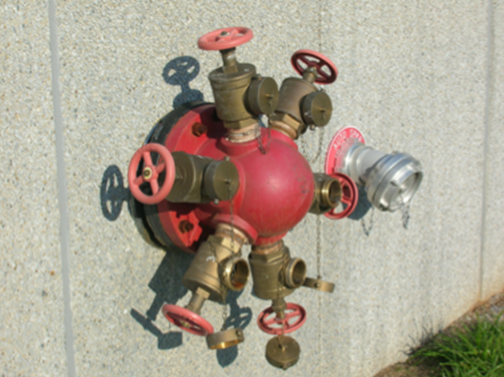 Hose valve manifolds are fed from a dedicated pipe originating from the fire pump discharge so that flow measurements from the fire pump can be measured while the sprinkler system is isolated. The specific, recommended procedure of testing a new fire pump installation is outlined in NFPA 20 (2013) Chapter 14. We will not go into the details regarding this testing procedure, but we will point out that the procedure involves discharging water fr om the fire pump outside of the building, typically through a UL Playpipe nozzle or other device. Once a specific flow is obtained, the fire pump pressure gauge readings are recorded, and the performance of the fire pump can then be compared to its performance curve. While this method has proven to be very accurate (if done properly), it’s neither environmentally friendly nor efficient. A large volume of water is used for the test while measurements are being taken, and many consider this use of water wasteful. If the water being pumped has been treated with chlorine or other chemicals, the water must be treated to remove chlorine before it is left to dissipate into the ground. Using a hose valve manifold to test a fire pump requires a team effort — those outside who are measuring the water flow, those who are throttling the hose valves to maintain a directed flow, and those who are in the pump room monitoring the fire pump and are recording the gauge data, shaft rpm, or even electrical volt and amp readings. Any improper coordination between the various participants in the test can result in improper readings. Care must also be taken in exactly how the water measurements are cataloged. The traditional measurement of water during a fire pump test involves the use of a Pitot tube, which must be placed into a stream of water on a precise angle and distance from the water orifice stream. If done manually, this involves an experienced person, and properly secured hoses which are connected to a set nozzle size; using a water flow without a proper nozzle size will not provide an accurate flow measurement. 50 feet of reliable 2-1/2 inch hoses are recommended, and should be kept as straight as possible. A location with good drainage is also preferred for obvious reasons. Testing a fire pump through use of a hose valve manifold with hoses is also dependent on weather in colder climates. If the weather drops below freezing temperatures, a test using this method is not recommended as it could create an unintended hazard of ice. Despite the challenges of needing a good place to drain the water, several properly trained individuals to run and monitor the test, proper weather, etc., this method of testing a fire pump has proven to provide the most accurate results. But the use of a hose valve manifold provides perhaps one of the most valuable tools for an owner of a fire pump — the ability to test not only the fire pump performance but the water supply as well. 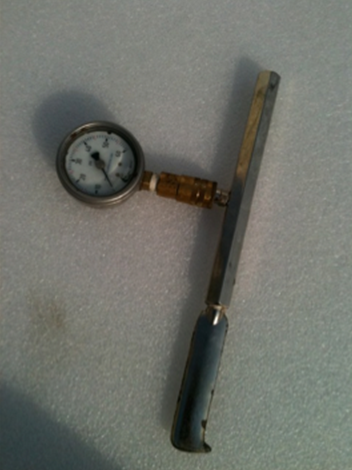 While releasing water, the suction pressure can be monitored and if there is an obstruction or closed valve supplying the fire pump, this fact will be discovered through the suction gauge readings during the test. A newer method that aims to simplify the testing process, as well as addresses many of the challenges using the hose manifold method of testing poses, will be explored in part two of blog series. Check back for the second installment of our series, as we dive into the advantages and disadvantages to using flow meters instead of the hose manifold method. As always, if you have any questions, don’t hesitate to get in contact with us. We’re here to help! Posted in Fire Pumps and tagged fire pump testing, hose valve manifold, NFPA 20, pitot tube on April 16, 2014 by admin.